It is really sad and disheartening to say the box office occupancy update of Thugs of Hindostan movie. Still, film is inside first week and shows are getting cancelled or reduced because of no to low occupancy. TOH was made in around Rs 250 crores. 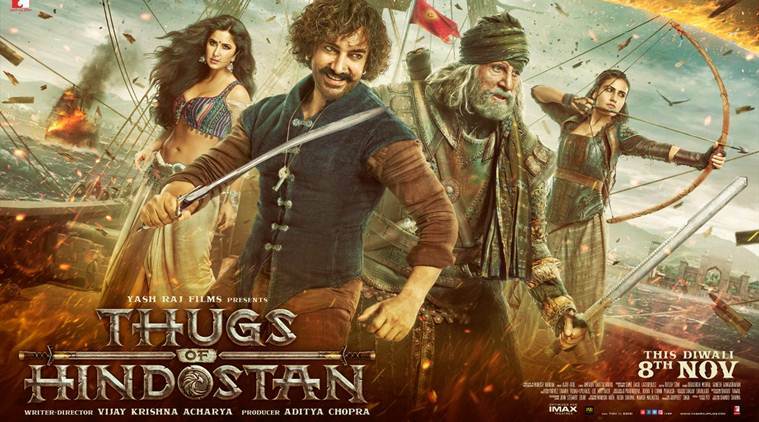 It is the costliest Bollywood film ever. Film was touted as the answer of Bollywood to Baahubali. Film was supposed to challenge Dangal for highest grosser of all time. Forget that it is even struggling to touch 150 crores. Don't remember when last time we have seen such a failure. It is massive heart attack for both distributors and exhibitors. Now coming to occupancy report for Wednesday. Honestly film is in doldrums. As early samples are coming in film is reporting a extremely low occupancy of 9-10% in the Morning shows. News is really depressive. Thugs of Hindostan has collected 134 crore nett approx in first six days. Film extended first week total is heading towards 141 crore nett mark. What's the collection if it is not holiday and ticket price not hiked. Aamir is holiday king only. honestly its not as bad a film as its made out to be....compared to other bad films, its in the same category.....its not as if we've not seen a worse film ever! Secondly, just get the feeling that ticket prices being increased became big news and when the film didn't match up, public came down very harshly......ticket prices being increased for Sanju and Race 3 weren't as big news as was the case with TOH! Why for race 3 and sanju. Just beat records on normal ticket price. In tamil nadu 150 is max price for ticket and if someone charge more than that theatre licence cancelled. They are still earning 200 300 crores and they have 1/4 th of screen than bollywood. @Lisa Better You Keep Quiet..
Because SalmanSir Always Used To Sale A Ticket At Normal Level Coz He Wants To Entertain All Category Of People..But Amir Always Used To Hike Price Just Because Their Business.. Yes It's Heartbreaker For Me Too..But It's Simply The KARMA Of Some Idiotic Nonsense Those Always Trolls SalmanSir Unnecessarily.. I agree....its ok to charge high for recliners and exclusive theatres......single screens and most multiplexes must be capped! @Big Evil : When Race 3 released, it had the highest ATP (Average Ticket Price) at that time! Looks like the end of Amair Khan Era. kisne bola budget 250 cr hai! It's almost 300 crore. Kisne bola TOH risky project hai. TOH Action, Amitabh Bachchan, Katrina Kaif, Fatia Shekh, Aamir, big scale (300 cr budget without aamir fee), big banner (yrf), dhoom3 fame director (victor), masala, romance, item songs, Highest ATP + 3D +4D+ GST, 5000 screens + Diwali release. Taalash has small budget and its not a flop, its an average grosser. You cant compare loss of 50 crore movie to a 300 crore movie. Its about the content without content everyone will fail misraeably..This time as the budget,star cast,production house and widest and solo release on a festive season like diwali the failure is gigantic and really disturbing for the distributors.This film will be an example of epic decorated disaster in the history of bollywood. Sunil sunil Sunil sunil Sunil sunil Sunil sunil ??????????????????????????????????????????????????????????????????????????????????????????????????????????????????????????????????????????????????????????????????????????????????????????????????????????????? bollywood director thing indian people are fool . Bhai historical point of u se kitni wrong movie h.